The Chevron company most likely needs no introduction. It is one of the leading companies when it comes to refining fuel, lubricants and additives. In light of this knowledge, it is no surprise that they also offer powerful and efficient fuel system cleaners. The most well known product is of-course Techron. Chevron is the original developer of both the patented PBA and PEA chemical technologies, which are used to effectively clean engine components. Most commercial products use PBA for it’s low cost and generally high efficiency. However, PEA is considered the superior technology when it comes to cleaning. Even though PEA makes fuel additives cost more, Chevron has managed to keep the price of Techron very acceptable despite its PEA content. When given the choice it is always a more logical option to pick the superior product. Simply pour the liquid into your gas tank. 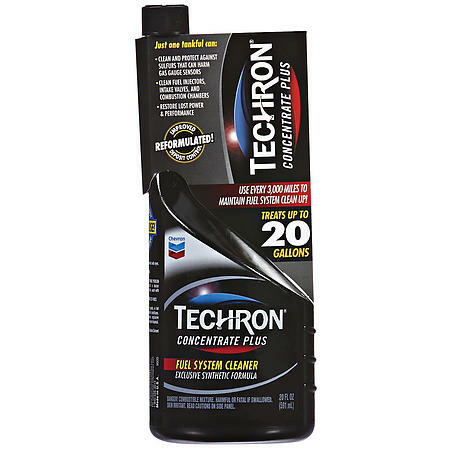 The Chevron 65740 Techron Fuel System Cleaner usually comes in either 12 oz. or 20 oz. containers and is recommended to be used in a 1:1 ratio with gallons of fuel. So, for example – a 20 oz. canister of Techron should be mixed with 20 gallons of fuel. For general maintenance it is recommended to use the cleaner every 3000 miles or roughly 5000 kilometers. It is not recommended to use this product in Diesel or 2 stroke air cooled engines. For more details, don’t forget to read the information label on the product. Techron is generally very well received and highly rated by consumers. 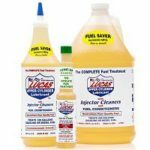 It is difficult to find negative reviews and most of them are related to the extreme expectations of any fuel system cleaning product. 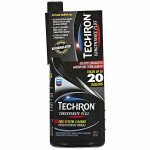 The Chevron 65740 Techron Fuel System Cleaner – 20 oz. (or 12 oz.) is a highly effective cleaning product from one of the most reputable companies in the industry. While it has some downsides of not being recommended for diesel and 2 stroke engines, it still boasts a wide variety of applications. Because of its patented PEA technology, it provides the highest standard of efficiency while keeping the costs lower than that of many competitors. Check out some purchase options below! It is listed as suitable for use in 2-Cycle Engines in its product data sheet. I bought a 20 oz bottle because my 02 pt cruiser was missing, shaking, and shutting off at red light’s, I put techron in my empty tank, filled up with chevron supreme, took the car for a 50 mi drive hard. Now all the issues I was having are gone. The car runs great. I’ve been using techron for years, I call it mechanic in a bottle. Check it out for sure. I used this on my 1996 Nissan Quest 3.0 l with 120000 miles. Cylinder no 5 was not firing and I suspected a clogged injector cause I could here it working with my screwdriver noise diagnostic test. I added 12 oz of techron concentrate and ran it for 15 minutes, still missing on cylinder no 5. I turned the engine off and waited 1/2 hour. To my surprise, no more misfire ! Drove it for 3 miles and came home to write this review. Glad I do not need to replace 6 injectors now and spend $300.00! I put some in my supercharged Camaro SS today. Been running like crap for about 2 months. Changed plugs and wires and still did it. Since it’s supercharged from a certain performance shop nobody would touch it to run diagnostics on it. So found a great tuner to put a new tune on it to see if that’s what it was. He ended up putting his temp gun on all cylinders and found #5 was running colder than the rest, but was still operational. So took a 3hr trip today. After an hour it got worse, crackling and popping just at idle. Stopped and bought the chevron cleaner before fueling up and on the way home it started running better. Hoping it continues to get better. Wonder if I should change my plugs again if everything stays ok and ends up fixing the problem. Just changed them two months ago. Maybe I’ll just take them out and clean them up. I just tossed some in my tank before I filled up and right as I started my truck up I noticed a much cleaner idle. Drove it home for about 1/2 a mile and it seemed to be running smoother. Can’t wait to drive some more and see what it does. My truck has over 185k on it so I’m hoping it helps more. Already very pleased with the results though. My truck no longer shakes near as hard as it did at idle. Use the product in my sons Grand Prix and my Late model Cadillac..Very good results in both cars,,,Highly Recommended! Gas gauge on 2010 Scion started getting erratic. Ran out of gas when gauge still showed 2 bars. Also would not show completely full after filling up. Had previously read on motorcycles forums that Techron had fixed motorcycle gas gauges. Ran 3 tankfulls at twice the recommended ratio and gas gauge fixed. Save a $200 sending unit replacement. This product spared me a very costly repair bill. My 1999 Nissan Altima check engine light came on right after fueling up. I got the code read at a local auto store. P300/304. Convinced that the bad gasoline has triggered the system. I purchased your product. I continued to drive the car. After several hours of drive time/idling, the check engine light went out! Fuel Injector cleaning – how to clean Fuel Injectors? Do fuel injector cleaners work? Copyright © 2014 - 2019 Fuel Injector Cleaner HQ. All rights reserved.